Locators should be stored in a file folder so you take advantage of new features that are not supported for locators stored in geodatabases, such as performance improvements, multithreading capabilities, and suggestions support. ArcGIS 10.4 is the last release to support storing locators in geodatabases. One of the first processes in geocoding is creating an address locator. This process always begins with opening the Create Address Locator dialog box from the ArcMap Catalog window, ArcCatalog, or the Geocoding Tools toolbox. Open the Create Address Locator dialog box. To open the dialog box in ArcCatalog or the ArcMap Catalog window, right-click a file folder, and click New > Address Locator. To open the dialog box using a geoprocessing tool, browse to the Geocoding Tools toolbox in the Catalog window and double-click the Create Address Locator tool. On the Create Address Locator dialog box, click the Browse button next to the Address Locator Style text box. The Select Address Locator Style dialog box opens. Choose the address locator style you want to use for your locator and click OK.
Click the Browse button next to the Reference Data text box. The Reference Data dialog box opens. Browse to the reference data you want to use in the address locator and click Add. Instead of following steps 4 and 5, you can also type the path and table name in the Reference Data text box, and click the Add button to add the data to the reference data list. Reference data that participates in a join is not supported when creating a locator. The joined data must be a permanent part of the reference data feature class before it can be used to build the locator. Use the Feature Class to Feature Class or Copy Features tool to create a new feature class that contains the joined data. When creating an address locator with reference data that contains millions of features, it is necessary to have at least 3-4 times the size of the data in free disk space on the drive containing your temp directory. Files used to build the locator are written to the temp directory before the locator is copied to the output location. If you do not have enough disk space the tool will fail after running for several hours. Repeat the process of adding data to the Reference Data table until all the reference data you want to include in the locator shows. Click the drop-down arrow and choose Primary Table, Alternate Name Table, Alternate City Name Table, or Alias Table. A primary table is a feature class containing the geometry and address attributes of the features that addresses are geocoded against. The address locator style defines what type of geometry and address attributes are supported. An alternate name table contains the alternate names, also known as street name aliases, for the primary names of the features. An alternate city name table contains the alternate names, also known as city name aliases to the primary names of the features. An alias table contains common names or location names, such as Memorial Hospital or Canyon High School, in place of street addresses. Both alternate name tables and alias tables are optional. A list of fields specific to the role of the data appears in the Field Map portion of the dialog box. The required fields are prefixed with an asterisk (*). The field named Additional Field in the Field Name column indicates the field is an optional field and is used for informational purposes only; that is, the locator doesn't use this field for searching or matching. The field is carried over from the reference data to the resulting candidates and output feature classes for your benefit. For example, if you want the locator to return a property owner field with other address attributes in the matched candidate, map the Additional Field to a PropertyOwner field from your reference feature class. If a field is not automatically mapped, click the drop-down arrow in the Alias Name column and choose the proper field name. Click the Browse button next to the Output Address Locator text box. The Output Address Locator dialog box opens. Specify where to store the address locator, name it, and click Save. If you want autocomplete functionality enabled when the address locator is published as a geocode service, check the Enable suggestions check box. Locators should be stored in a file folder so that you take advantage of new features that are not supported for locators stored in geodatabases such as performance improvements, multithreading capabilities, and suggestions support. ArcMap versions later than 10.4 do not support storing locators in geodatabases. For performance reasons, house number (or unit number in the case of US Address - Single House Subaddress style) is not used in suggestions capability. This means that, while house numbers are displayed in generated suggestions, they are not validated until a geocoding request is sent. Therefore, if the house number typed by the user does not exist, it will be displayed in suggestions but will not be returned from geocoding results. Best practice when creating a custom locator using suggestions is to create a composite locator with at least a street address or point address locator and a street name locator. Doing so will ensure that, if the house number doesn't exist in the street address or point address locator, you'll get a fallback match to street name. For more information on creating a composite locator, see Creating a composite address locator. Suggestions are currently only supported for locators published to ArcGIS Server. The create address locator process initiates. When the process finishes, the address locator is saved in the workspace you specified previously. Also, it is added to the map if you started the process from ArcMap. 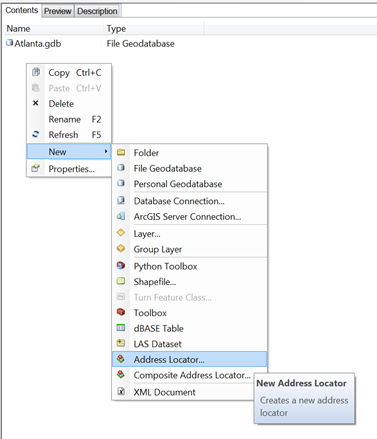 An address locator can be published as a geocode service using ArcGIS Server. This requires an ArcGIS Server license. Address locators can be grouped to become a composite address locator. This allows addresses to be matched against multiple address locators to find best matches.